Can you belive today is the last day of school? I am in shock! So excited to have the kids home and enjoy the house. Life continues to be a bit of a struggle settling into the new house while co-habitating with builders who are finishing up. We are probably about 85% of the way there and the dirt, dust and mess are disheartening at times. We are enjoying the house. I had my last Material Obsession class last week. I have two quilts to quilt over the holidays! I am chipping away every night, but find a struggle as I am so tired after having fun all day. My husband had his birthday yesterday. He got a few little presents and the kids and I whipped up this cake as part of his celebration. It looks amazing and I can’t wait to try it! 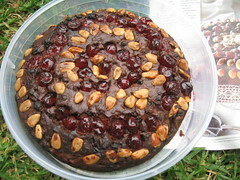 It needs to sit for a week and a half, so next week we will be tucking into it! I hope to post some photos of the quilts progress. Otherwise doing a lot of kid Xmas craft and will try to post some photos of our efforts. Crafting has suffered a bit this year, but 2010 watch out! Not a lot of sewing, but a lot of baking and eating. 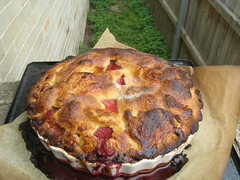 This was my first attempt making a peach and blackberry pie. It was delicious and tastes of summer. I am keeping the sewing machine out on the table thinking I will steal a few nights to sew, but it just hasn’t happened. Too much Christmas joy and celebrations. Tomorrow we are hitting the City to see the big guy in the red suit. Say hello if you see me tomorrow. I’ll be the one dragging two wild kids around with a crazed look in my eye. 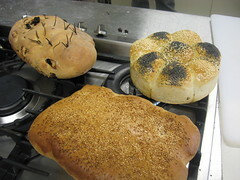 The North Sydney Community Centre hosted a wonderful class about baking bread this past weekend. I can’t believe how easy it is. We baked bread, rolls, brioche and pizza dough. The teacher was such a fun, dynamic lady she really inspired you to want to go home and try. This Thursday I am going to attempt the lemon brioche for Friday’s morning tea. Wish me luck! Belated birthday celebrations for school tomorrow. 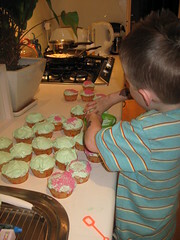 Blue icing with pink sprinkles full of artificial coloring to really put the kids into orbit on last day of term.